If you have bought a HomeGuard CCTV System and need installation then please call us on 0800 211 8310 for a free quotation. 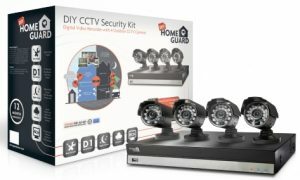 Homeguard is one of the world’s number one DIY home security brands and they sell a wide range of CCTV solutions for both homes and businesses. Their comprehensive range is known for its high quality and diversity as well as its excellent prices, feature rich design and high performance. If you have bought a Homeguard CCTV system then it’s important that if you want it to operate efficiently and effectively that you ensure you get it fitted by expert CCTV installers like ourselves. Our Homeguard CCTV installation service can install any Homeguard CCTV system for you wherever you are in the UK for both homes and businesses. Our CCTV installers will ensure that all of your Homeguard CCTV cameras are fitted correctly and are fitted in locations that offer you the best protection for your home or business. They will make them as obvious or as discreet as you want them them and will also ensure that your viewing and storage options are set up correctly. They will also make sure that you know how to use your Homeguard CCTV system fully and that you are confident using it. Call our professional Homeguard CCTV installation experts and have them install your Homeguard CCTV system safely, securely and care, ensuring it is fully working and taking care of you, your family and your property.We have installers on hand across the UK, waiting to install your new Homeguard CCTV system.